In all of the states and countries I have bought and sold in, never have I seen so many smalls in one state. Shop after shop is filled with smalls, dust collectors, silly and cheap souviners, novelties and just assorted crap. LOL Still, I worked my way through two thrift stores and a collectible mall and did find a few treasures among the junk. Found this lovely flow blue transferware, low bowl for a few dollars. Sweet opalescent milk glass chicken on a nest with cold paint red details. These are always a good seller for me. Sweet little souvenir "fairing" of a porcelain shoe with gold luster calligraphy "Waterbury, Ct." These were popular as gifts for travelers at the turn of the century through the 1920s. Nice pair of 1920s ladies shoes in great condition was a Treasure Trove find. Pretty little powder dish with brass topper. Circa 1900s. I love these handled tea sandwich or cookie servers. Very popular in the 1930-1940s, this one is the palest shade of lavender with stunning gold lustre on border and handle. I am trying to convince myself I don't need it and need to sell it. Great find from the collectible and consignment mall, a late Victorian, bentwood hat rack. Nifty copper finials, this piece is dated 1880-1889. Lovely EAPG covered dish was a great find. A rare pattern by King & Son, this non-flint covered dish with the sought after bleeding heart pattern, circa 1870s. A pair of large porcelain doll heads. Both had wigs and eyes of which I removed as I will use these in Halloween pieces. Okay, okay, yea I put the blonde china doll wig on my little girl. She was not happy but after I fell into a pile of giggles you have to admit, she is a great "Doxie-Godiva". treasure from heaven...and heaven is receiving treasure parcels from Vintage Village in Snellville, Georgia. It was a banner day as two parcels arrived on Saturday and I couldn't wait to open them up. The smaller parcel contained a stunning hand crocheted with knitted edging piece that was made for a fireplace mantle. I have such a weak spot for needlework and this will be displaced in my new home (when I find one, LOL) It also had the vintage tablecloth with scalloped edges and embroidered tone on tone doves. Best of all was this fantastic, antique clock face with the sweet note tied to it, "missing the time you spend visiting us, we miss you and a gift of time to remember us". My heart is full but this lovely token. Two days after I purchased the needlework, this gorgeous, splint market basket was on their page along with an early paper heart box and Victorian jewelry casket. I collect these jewelry caskets and always looking to add to my personal collection. Such a lovely little vintage Valentines heart box from Necco. What made my heart beat fast...I am head over teakettle with this pretty little market basket which is in marvelous condition. No broken splints an the handle is strong. A true American antique, this will hold my hand spun next to one of my spinning wheels. Okay, so lesson learned, and new personal policy...when you see something on the Vintage Village facebook page, ask them to hold shipping for a few days because you will find more treasure. Thank you Debbie and her wonderful dealers for working with me long distance. Back on the house hunting train again, the offer I made fell through, too many high ticket items needed replacing and the seller wasn't open to fix/repairing them. After spending the morning looking at homes, I stopped in a Goodwill in the area. Interesting how Goodwills' differ greatly from state to state. Georgia Goodwill's are fantastic with color coded racks and simple pricing. Florida Goodwill's do vary as you go father south but clothing is stuffed tightly onto racks without any rhyme or reason, they also sell store closeout items and prices are assigned like a thrift store without any real sense. Example, I pulled three different blouses from a rack and they ranged in price from $3.99 to $14.99 and they were not designer pieces. Go figure. Additionally, there is no senior citizen discount...of course, that could be because half of the population is senior citizen, LOL. Lovely Bavarian teapot. It was missing it's lid, but too pretty not to bring home. Nice, English flow blue luncheon plate in the coveted Willow pattern. Stunning pair of Hutschenreuther dinner china. Heavily encrusted gold over a lovely inlay pattern. Would make a pretty setting with a romantic dinner for two. The three day weekend allowed me to do more exploring around my new town. So I took a little drive to Junque from the Trunque in Trinity, Florida. An inviting entrance to this darling little shop. The minute you walk through the door you know you have stepped into a marvelous shop. Rich in little vignettes of mid century pieces, Victorian china, turn of the century camera's...all pure joy. Head over teakettle with mad love for this set of lobster serving pieces. Stunning display of vintage perfume bottles. Perfect for Old Hollywood glam. A room devoted to "mantiques" and you will find something for any man cave in here. Couldn't resist these rhinestone earrings from the $5.00 box. Also the MOP and gold wire "Mary" pin and a chain mail glove that is used by a chef to avoid cutting their fingers during a mad chopping prep. Junque from the Trunque will be on my regular swing by calendar as there is always something unique to find within. As I returned home, the Lyon's Head Antique Mall was having a sidewalk sale so I pulled in to see if I could find treasure. Score!!! A big box of vintage glass Christmas ornaments from the 1950s for $3.00. Some of these balls are the size of a softball too. A marvelous find as well. Lovely Victorian walnut fern stand in the Eastlake style. I can't wait to feed it some oil and beeswax to bring up the beauty of the wood's patina. In between the antique shopping I found a home and put an offer in. Hoping it all comes to fruition as I am anxious to nest in and then find a new shop to rent space from. Blessings to you and those you love, Sea Witch. Hello dear readers and I hope everyone had a marvelous Christmas and Holiday season. So glad 2017 is here. I left Atlanta on December 19th with a trailer attached to my vehicle and a few pieces strapped to the rooftop like the Beverly Hillbillies. Landed in New Port Richey, Florida and after squatting at a friends house for a days, I found a little place to rent until I find a home to settle in. Unpacked the trailer and the antiques on the top of my vehicle and spent the next few days becoming a Florida resident. In between trying to close on my home in Georgia and finding a new home in Florida, I have been searching out antique and vintage shops in my new area. It's always interesting to see how different regions set up their shops and the items they sell. My first observation is that I have never EVER seen so much glassware and pottery in the volumes that each of these shops offer. I understand that "smalls" reign supreme to meet needs of the tourist seasons but the sheer volume and high prices (book values and even higher in some cases) has been a shock for me. I'm finding it difficult to believe that all of this high priced glassware and pottery actually sells and the faded price tags may be indicative of my observations. So my journey continues and as I meet and speak with other dealers I will let you know what I have learned. First stop was at the Lyons Head Antique Mall in Port Richey. These dealers offer antiques and lots of mid century pieces and smalls. EAPG is priced very high in this area and by the dust I see on the pieces and the faded price tags, I suspect they will continue to sit on the shelves. However, if you look deep within dealer spaces a gem or two will rise. Found this stunning, EAPG celery server in daisy button pattern, in the large canoe shape. It has just the slightest shade of sun purple, which I know is an abomination to serious EAPG collectors, but I don't mind it if it is the natural transition by the sun rather than artificially by man. Found a pair of EAPG pitchers covered in dust and in marvelous condition. Right now I am using the big, squatty one to hold my kitchen utensils in the little rental I'm in. All of my household goods are still in a POD unit until I find permanent digs. And finally, a low square open compote also gently kissed by the sun. From Lyons Head it was onto Treasure Trove. 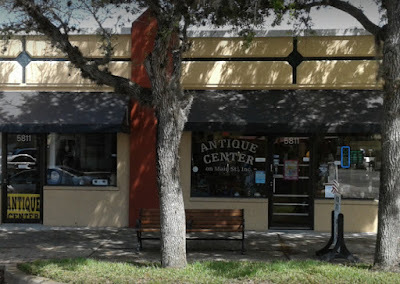 Treasure Trove Mini Mall and Consignments in Hudson, Florida, is also a multi dealer mall with a smattering of antiques and lots of mid century furniture, collectibles and clothing. I did find this stunning, ABCG bottle for a few dollars because it had a big chip on lip. I don't mind damaged pieces like this and this one is a stunner. Close up of the cut work. Darling little brown jug (about 8 inches high) from the turn of the century followed me home. Granny's rheumatism medicine in a travel size. Always have a weak spot for these sweet little copper clad shoes. They are a lovely decorative element for Christmas when filled with holiday pics or vintage Christmas balls. And finally, hidden away at the bottom of a shelf in a back room booth, was a pair of these fantastic EAPG bread plates. By McKee Bros, 1880, the pattern is scroll with flowers. There are tiny Stars of David around the plate so I can see this being used in the weekly Shabbat. Made a trip to the business district of New Port Richey...fell in love with this little town, and met a gal pal for lunch. But first I visited Antiques on the Main. Antiques on the Main in New Port Richey is amazing. Filled with true antiques with a small group of select dealers. A truly charming place for the discerning collector. Found this lovely cast brass pen holder there. This will be placed on my antique captain's desk and will place an antique ink pen in it. Mad love for these turn of the century, tie dyed parlor tablecloths. Lots of fringe, this one is brilliant in color. The tasseled crochet butterfly antimacassar (doily) looks great on it. Delighted to find this Victorian milk glass Easter egg. It is a big one too and just in time for the upcoming Easter holiday. Made a trip to Tarpon Springs to visit Pistachio's Antiques & Collectibles and what a joyful place. A barn building filled to the brim with antiques and American mid century items that will turn your home into a Mad Men set. Treasure abounds everywhere inside so check out every nook and cranny. This was the largest collection of invalid/hospital feeders I have seen in one place. The English ones were with decorated with pretty flowers. These were also priced to steal away. My favorite section was the outdoor wall. Crazy mad for this bed spring. Great painting of "Ole Blue Eyes" in a room filled with everything you need for a Mad Men do over. The Retro Lounge and paper parasols are calling. I couldn't leave without this Red Cross feeder. flow blue advertising cup is a gem. I then took a quick trip to the historical downtown area of Tarpon Springs. Fell in love with this pretty little community, but unfortunately, the homes that were available were way out of my price range. Still, a marvelous place to take family and friends when they visit. Tarpon Springs is home to the historic sponge docks and an industry built by Greeks. It is now famous not only for the worlds finest sponges but some of the best Greek restaurants, markets and bakeries in the country. Fell in love with Mad Hatter General Store. Unique gift items, decor and clothing with a blend of bohemian and steam punk vibe. Next stop, Finder Keepers, on Tarpon Street. A lovely antique store with something for everyone. Nice selection of vintage reels for the fishing collector. I could purchase every piece of this pattern they offered if only my wallet would indulge me. A stunning tea set with ebony handles was priced for the taking. I had to talk myself out of walking out with it as I just don't need anymore tea service sets. Heck ya, I came home with a sponge from Tarpon Springs. This big boy is a vase sponge and I will fill it with french lavender soaps. Bought this lovely mother of pearl and shell handle large serving spoon as well.